Today Dog is having fun on the farm. First he runs and skips across the green fields to play with the sheep and lambs. Next, he goes to the barn to visit the farmyard cat and her three furry kittens. After that, Dog is thirsty, so he has a refreshing drink with the little piglets and their big pink mother. There's more watery action as Dog splashes in the puddles with the ducklings. After all that excitement, Dog is tired out. He curls up with the hen and her fluffy chicks for a rest. Sleep well, Dog. Youngsters will find this book every bit as comforting as Dog's relaxing snooze. With appealing images to look at and action-packed words to talk about, it is a wonderful aid to learning that little ones will want to return to again and again. 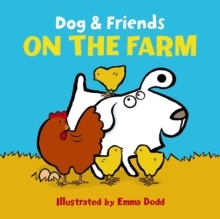 Dog's farmyard adventure is perfect for reading aloud to small children, or for more confident readers to enjoy by themselves.